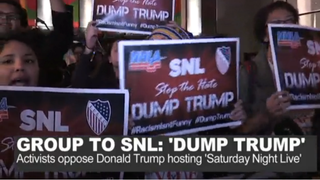 That's what a group of Hispanic leaders and protesters are calling on NBC's Saturday Night Live to do regarding Republican presidential candidate Donald Trump, who is slated to host the popular comedy sketch show on Saturday. If not, protesters plan to march outside the studio with "Dump Trump" placards and chants, according to NBC News. The complaint comes after Trump this summer called illegal Mexican immigrants "rapists" and "murderers," along with other disparaging comments. Marchers hope to show SNL and NBC, the network that carries the show, that many Hispanics see Trump's appearance as condoning his views, which they view as hate speech and racism, the report says. It's the second protest in a week. On Wednesday evening, a protest garnered about 30 protesters, and organizers gave NBC a petition signed by over 500,000 people asking SNL and NBC to "disinvite" Trump, the report says. "Immigrants, Latinos, supporters do not deem Trump's appearance on SNL and NBC's backtracking as funny," Juan Escalante, who drafted the #RacismIsntFunny petition, said, according to NBC. Saturday Night Live has declined to comment on the protests.